There's a thousand ways to die out here. Unless you want to experience one of them, you'll follow me and do what I tell you to. Blight-trackers are surface explorers and rangers without peer, experts at navigating the irradiated wastelands and avoid the touch of Blight. 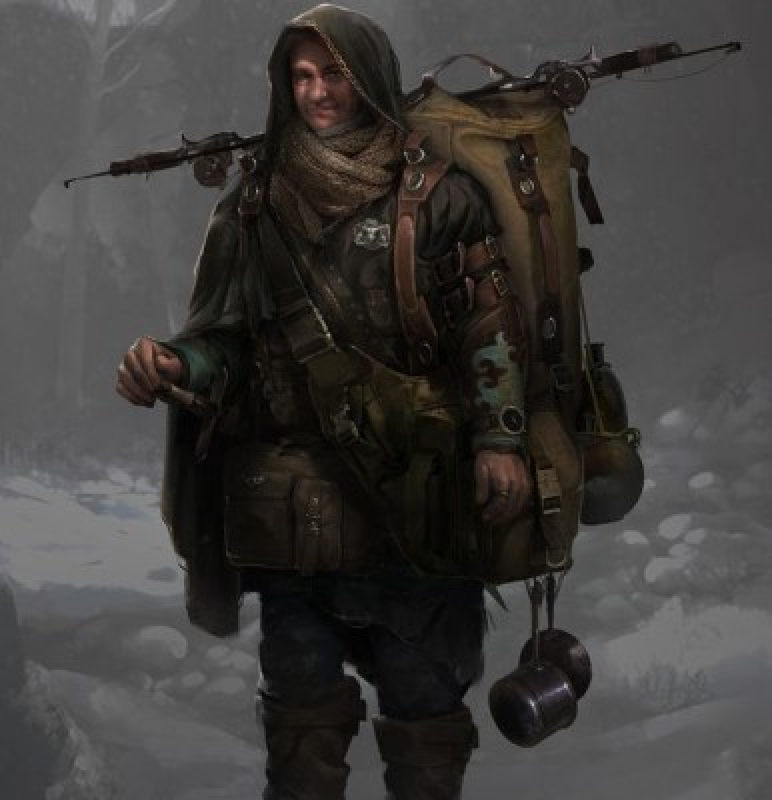 Sometimes called the Kaia of the Surface World, the Blight-trackers are used as guides and explorers by any serious expedition heading out into the wastes. Blight is a quiet, unseen killer and the wise take every precaution to avoid it. No, not that road. See how the sands on each edge have this moss on them but there's nothing in the gully itself? If something like that can survive on the Surface but not down there, what makes you think that you can? Among those who explore the surface, the Blight-trackers are the most skilled and possess hard-won knowledge of how to avoid the most insidious hazards of the Surface, that of Blight. Unlike Kaia, the blight-trackers usually work alone or in pairs, trusting few but their own expertise when it comes to the many ways that death can claim the unwary on the Surface. Many consider them more than a little mad: who in their right mind makes a living of heading out into the wasteland of the surface world? For their part, blight-trackers find their calling for any number of reason. From family tradition to insatiable wanderlust, Blight-trackers take pride in their ability to go where others fear to thread and make a good living doing so. Anyone who intends to go to the surface will want a tracker on their team. I know myself well enough to realize why others can't be trusted. Blight-trackers work alone or in small pairs, typically that of master or apprentice. In their typical role, they are hired by a larger party to guide them through the Surface and help them avoid the areas of Blight. Trackers are slow to trust and each tend to think that they have the best way and that other trackers will get them killed. While not always the case and attitudes are changing with new generations of trackers, there is little camaraderie between Blight-trackers. In the rare cases were tracker form teams, they do not divide roles or responsibilities. Everyone is a blight-tracker and everyone has the responsibilities one. These teams are usually forced creations, made when particularly large expeditions hire several blight-trackers to aid them. These interactions have lead some to call the "bickering-trackers" and it is not a nickname they take well to. Most trackers start their career as an apprentice to an existing master and learn the craft from them. Every Blight-tracker have their own criteria for taking on an apprentice but there are a few common traits they seek: tough, smart and with grit. Less honest trackers take on less than capable apprentices with no real intent of ever seeing them graduate for the intent of cheap labor. The apprentice does whatever it is the master tells them to, often seeing to menial tasks of cooking, cleaning and carrying. There's no formal way shared among trackers when an apprentice has become a master himself. Some trackers will tell them, while others leave the realization to the apprentice themselves. It is often a difficult and harsh journey with considerable turn-over. Blight-scars are common marks of an apprentice, often forced to do the more risky parts of blight-tracking. If you think you want to be a tracker, you're not cut out for it. Don't think, know it. In recent times, aging trackers have begun to establish schools and more formal apprenticeships in the city-states with access to the surface. These vary in quality depending on the tracker and many traditionally taught tracker look down at these "text-taught" trackers as lesser, though that cantankerous attitude is often the first reaction to anything by these elders. These schools follow a more-or-less structured and tested curriculum, with many still in their infancy and the lore behind blight-tracking still little more than individual observations put together. The advantage of such schools have been trackers that agree on basics and their approach, as well as being considerably easier to work with. Can you imagine being the first? Going up here, seeing nothing but dust, sand and death then going "aye, this'll be a lark"? It is difficult to follow the history of blight-trackers or know when repeated experience and experiment gradually became knowledge. The earliest recorded activity of a blight-tracker is at least a century old and there have been several false starts and dead-ends since then. Exploring the Surface is a dangerous venture and in large part due to Blight and early trackers critical part in these expeditions did much to solidify their reputation. Today, tracking is going through something of a transformation. Schools are opening and challenging the old system of master-apprentice. Ideas are being exchanged rather than horded and many hope to range further than any of the old guard ever could. "Never carry something you're not going to use" is a common saying among the Blight-tracker. Equipment is carefully selected depending on where they are going and who they are guiding, but there are some tools that have almost become synonyms with blight-trackers. Most famous among them is a box with black, metallic sand in which the blight-trackers trace minute movements to determine the presence of Blight. Other tools of tracking vary between trackers, from pendulum and dowsing roads. The use of Star-Metal is rare; once the metal has begun to shine, it is already too late. The trackers were rugged, practical clothing suitable for what part of the surface they intend to explore with the shrouds or hats to avoid the sun's scorching rays. Always keep a weapon handy and sharp. Know how to use it. Unlike Kaia who are popular and well-regarded by the citizens of the underworld, Blight-trackers have a more complicated reputation. Their place as guides and wardens against a hazard no one else can even see makes it easy to place the blame when something goes wrong. Amateur blight-trackers that blunder head-first into searing irradiation or simple mistakes that aren't caught until days or weeks later when the effects of Blight-poisoning set in only make matters worse. Blight-trackers are sometimes accused of leading travelers to their doom or abandoning them in the wasteland, and there is some truth to that. While most do not, many blight-trackers value their own lives far more than those of their client. Expeditions that seem doom to failure sometimes see the trackers simple leave in the middle of the night, ensuring what might have been just possibility. There aren't many traditions among the trackers, but a few have managed to spread from master to apprentice or cropped up independent of one another in different places.The most notable among them is the first hazing, when the master first takes the apprentice into an area of shifting but usually low radiation and leaves them there. This is where many apprentices gain their first blight-burn. I've always had a soft spot for rangers lol I love seeing them in strange settings as well. It took me a moment to really get through it. You have a few grammar errors but I'm not really disuaded by that. Apart from this I may have missed it but I'm wondering why the big shift from the master and apprentice role to the the school system happened. Was there some event that caused it? Wonderful as always, I love the language and the layout. The idea is good and I love how you use the Kaia and link to it, it made me get a bit of a deeper understanding of both! I found a small mistake: "In the rare cases were tracker form teams" I'm pretty sure it should be "where" instead of "were" Keep being awesome! I love this, it's so good with how it's written. At first you would think that someone who is known to see death and survive the harsh wastelands is going to be an edgelord that doesn't make friends that well, but with the way it's written you don't get that edge to it. Instead it is more along the lines of these Blight-trackers being helpful, but just not that up for competition in the same job. How much would a trip through the wasteland cost? Are there any famous Blight-trackers people recommend? A fair bit; they're definitely high-priced professionals and they're in a pretty good position in their negotiation in that you might die from radiation poisoning without them. There are; I should add a couple of those to the sidepanel! Thanks for the prompt!